Robert has been a franchise owner in Coral Springs FL since 2006. “I’ve been working in retail since the age of 10. My dad and late uncle would take me to their men’s clothing store to work and learn the trade and at 20, I was a partner in a men’s apparel store. 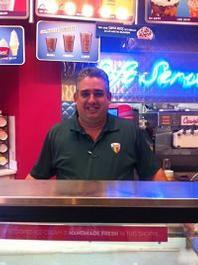 Also during 11th and 12th grade at school and college freshman year, I worked part time at a Carvel on Miami Beach”. 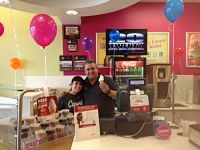 “I decided to buy a Carvel franchise as I was looking for a change and something fun to feel younger again. I always looked back at my Carvel part time job as a fun time. So, when the Shoppe that I currently own became available to purchase, there was no doubt that this was the direction I wanted to try. And because Carvel was such a strong name, I felt it was the right fit”. 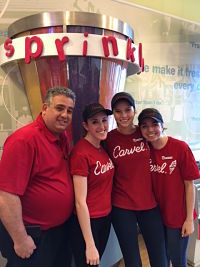 Carvel provided Schwartzbaum full training; “My training consisted of spending 2 weeks in Atlanta and learning to make all products, placing orders, how to make sure to get the most from our product, and to understand how to schedule for busier days”. Carvel are constantly adding and improving product lines to satisfy customers. “A typical day usually includes making up orders such as casting cakes, decorating cakes, making flavors and novelties. There is always office work to take care of also and this happens before we open our doors for the day! Rest of the day is making sure every guest leaves with a smile on their face”. Schwartzbaum appreciates meeting a lot of great people through being a franchisee, both within the franchise family and guests, some of them whom he calls very good friends. “Coming from a Mom/Pop business before entering the franchise world, I have learned what it is to have pride in wearing a uniform of a company that has been around for over 85 years. I have learned that I am not alone when I need help. It feels good to have the support of not only the franchisor, but of fellow franchisees. You become a part of a “family” of owners doing the same thing, trying to make their brand stronger because if you do that, your Shoppe becomes better”. His advises new franchisees “make sure that you really like and/or believe in the product/company that you will be working with. Ask the franchisor how they support you before and after purchase. Get in touch with current franchisees as they will give you a perspective on how that franchise community feels about their franchisor and product”.